Citation: C N Trueman "Edward Seymour and Government"
Henry VIII died in 1547 and his son Edward VI succeeded him. In 1546, Henry had clearly stated his desires in his final will and these replaced the Succession Acts of 1534, 1536 and 1544. Edward was to succeed him and if Edward died without an heir, the crown would pass to Mary. If Mary died without an heir, the crow would pass to Elizabeth. Henry knew that his ill health meant that his reign, by 1546, was coming to an end. Henry knew that Edward would be a minor and would, by the very nature of this minority, be vulnerable to a power struggle among the senior nobility. Henry therefore made provisions for this by setting up a Privy Council of sixteen of his most trusted advisors who were to govern the country until Edward reached eighteen. This council of sixteen was meant to have a balance between conservatives and reformists and all members of it had equal power. Henry died on January 27th 1547. It soon became very clear that the Privy Council of 16 would not work simply because the members in it were too pre-occupied with advancing their own individual power bases as opposed to ruling on behalf of Edward. The Council needed one strong man in charge of it if it was to succeed. Edward was too young to fulfil this role. This role fell to Edward Seymour. He had three things in his favour. 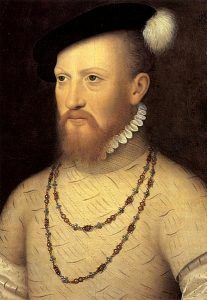 Seymour had gained a very good reputation as a result of his success in the Scottish Wars and in the final years of Henry’s reign he was held in high regard by the king. Seymour was also Edward’s uncle. Seymour was also known to be a reformer and it was hoped by high-ranking Church officials that he would push forward the reforms introduced by Henry. Such a combination gained him more authority in the Privy Council than anyone else could muster. On February 1st 1547, Lord Wriothesley, Chancellor, announced at the Tower of London that Seymour had been made head of the Privy Council and by the end of the month Seymour had been given the title Lord Protector. He had the power to dismiss and appoint members to the Council. In recognition of this position, Seymour was made Duke of Somerset. He was given confiscated monastic property to support his new title. Historians have a mixed view on Somerset. Some believe him to have been a man who sympathised with the plight of the poor – a classic social reformer. Others view him as nothing more than a greedy man who used his position to advance only himself with no care towards social reform. Others believe that he was neither greedy nor a social reformer – just a patriotic soldier who had done well for himself and wished to serve his king accordingly. It is quite possible that Somerset had attributes in all three categories. No evidence exists for the Privy Council not working loyally for Edward. However, it had to face challenges that it was probably not equipped to cope with. Economic and financial reforms were mere short-term solutions to problems that had existed in the final years of the reign of Henry VIII. Somerset has been criticised for showing weak leadership during this period but he was facing problems no one had experienced and had nothing to fall back on in terms of dealing with these problems. Combined with financial and economic woes, Somerset also had to deal with a complicated religious scenario created by Henry. On top of these was how he should pursue the nation’s foreign policy as war with France and Scotland was never far away. Wars cost money and England was in a parlous financial state. Somerset would have been aware that one of Henry’s final wishes was that a marriage was to be arranged between Edward and Mary, Queen of Scots. In the last years of Henry’s reign, he had spent prodigious sums of money on wars and defence expenditure. Somerset and the Privy Council inherited this and at the start of Edward’s reign, the state was all but bankrupt. Henry had sold off much Crown land to raise money. He had also handed over former monastic land to continental bankers in exchange for loans. By the end of Henry’s reign, Crown land raised a paltry £200,000 a year. Somerset needed to reform the nation’s financial structure – but he did not and he fell back on debasing the coinage of the land and seizing yet more Church property. These could only offer short-term gains. Somerset also had to deal with an increasingly complicated social and economic situation. The population of the country was increasing but employment opportunities were not. Therefore, England was experiencing an increase in vagrancy with the potential for an increase in crime. There was also a greater increase in demand for goods, which had the potential to be inflationary. The first few years of the short reign of Edward also saw harvest failures. This again led to an increase in prices while the poorest could not afford the very basic foodstuff required. There is little doubt that Somerset and the Privy Council faced problems that had solutions that were beyond them. The evidence indicates that the Privy Council was more concerned about public disorder, rebellion and riots stemming from food shortages than the day-to-day existence of the poor. Henry’s foreign policy had left England in a precarious position. Not only was there a potential for wars on two fronts (Scotland and France) but such wars were very expensive. In the reign of Edward, Somerset faced the dilemma of pulling out of any potential war but saving money. However, national pride effectively hamstrung this, as few senior nobles would have supported a placid foreign policy towards France or Scotland, as it would have been viewed as an insult to national pride. However, any increase in taxes or the introduction of new taxes to finance such wars would have been equally unpopular and could have led to a popular uprising. Somerset was well aware of the quandary he faced and it seems that between February and November 1547, he came to the decision that war and national pride were more important and that any fear of a popular uprising would be overridden by the popular support for the new boy king. Parliament was summoned to meet on November 4th 1547. One of the first pieces of legislation passed was the Treason Act. This repealed a whole series of unpopular legislation passed in the reign of Henry VIII. It allowed religious issues to be discussed in the open and it removed censorship so that work by Martin Luther and John Calvin could be openly brought into the country and read. The law also allowed the printing of such material. Somerset may have faced many serious issues but he was no fool. He knew that such an act would be popular and that it would further his reputation as a reformer. However, the act provoked acts of public disorder as meetings regarding religious issues frequently got out of hand. The one thing Somerset wished to avoid were issues of public disorder and his ‘modernising’ act created what he wanted to avoid. The Treason Act also withdrew the 1539 Proclamation Act. When Parliament was not sitting acts could be introduced as a result of a royal proclamation as long as they did not infringe on acts already on the statue book. The Proclamation Act stated that such proclamations had to be obeyed. This had been a concern to Parliament as it gave the opportunity for a monarch to rule without it. The Treason Act did not end proclamations and never intended to do so. However, it was designed to tighten up the procedure. In fact, there was year in year out more royal proclamations in the reign of Edward than in Henry VIII’s reign. Henry averaged six a year while each year there were nineteen in Edward’s reign. Over half of these, seventy-seven, were issued by Somerset. Few think that he was abusing his power as Protector. He was simply responding to the major issues of the day that needed a quick response. There is no evidence that either Parliament or the Privy Council complained about his actions. Somerset’s most pressing need was for money. In 1547 he shut down the chantries. These were small religious houses endowed with land to support a priest whose duty it was to sing masses for the soul of the founder. The 1547 Chantries Act shut them down and commissioners were sent out to confiscate their land and to collect any gold and silver plate they had. These were immediately melted down and made into coins. However, the more coins that were in circulation the more inflationary the economy became, which led to price increases especially in grain. This in itself had the potential to create public disorder. Somerset met this problem head on and showed little care for the poor. In 1547 he introduced the Vagrancy Act. This stated that any able-bodied person who was out of work for more than three days should be branded with a V and sold into slavery for two years. Other offences by the same individual would lead to a life of slavery. This act did not show Somerset in a humanitarian light and many local authorities refused to enforce it as they knew such legislation would be highly unpopular in the localities and that they, as the enforcers of local law, would be blamed. There is little doubt that the Privy Council was scared by the potential for trouble that increasing food prices caused. Its reaction ended up angering two important sections of society – the landed rich and the poor. The Privy Council believed that enclosure was forcing up the price of food and sent out commissioners to investigate the impact enclosure was having on rural life. This failed for two reasons. First, it increased the hopes of the poor who fully expected some legislation to be introduced that would reverse enclosure. Secondly, it increased fears among the landed class who believed that they were being blamed for food price increase, which they considered unfair. Legislation did increase the tax on wool and restricted the length of leaseholds. This did even more to antagonise the landed class but the poor expected even more. Therefore, the Privy Council, led by Somerset, lost the support from both classes. If the Privy Council wanted to attack the cause of unrest and potential riots – it only succeeded in angering the very class it professed a desire to help. In response to a situation that looked like getting out of hand, the government banned football as the game frequently ended in a riot and Somerset feared that this would be a catalyst for worse happenings. Unlawful assembly was banned as was the spreading or rumours. The punishment for breaking any of these new laws was to spend an unspecified amount of time in the navy’s galleys. To his enemies, Somerset did not seem to have any long-term policies. They believed that all of his measures were short-term answers – a knee jerk reaction rather than a considered policy. Support for Somerset quickly tumbled when rebellions broke out in the West Country and East Anglia – the one thing that Somerset had wanted to avoid. To his enemies this was sufficient proof that Somerset’s policies were a failure. His position was made weaker by the fact that local authorities were unwilling to intervene without government help. However, Somerset did not want to withdraw army units from fronting the French and Scottish threats and he was essentially left short of the military clout needed to suppress the rioters. Eventually the majority in the Privy Council realised that the situation was bad and they ensured that local authorities had the military support that they needed and the rebels were defeated. However, the episode spelt the end of Somerset. On October 11th 1549 he was arrested – there was no opposition from any other member of the Privy Council. In 1550 Somerset was released and allowed to rejoin the Privy Council. But his power base had gone, as John Dudley, Duke of Northumberland, was now the main power in government after his success against the Norfolk rebels. In 1551 Somerset was accused of plotting against the government. He was executed in January 1552.